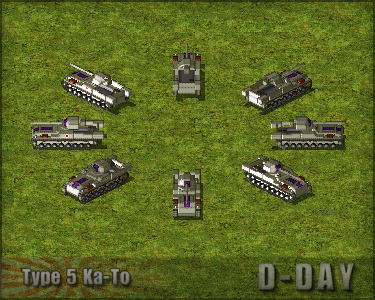 Japan brings out the big guns with these five heavy tank destroyers. Click of the unit names to visit their D-day wiki page for more information & pictures. 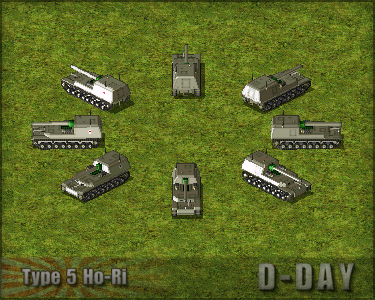 Development of the Type 5 Ho-Ri tank destroyer started in 1942 in parallel with the Type 5 Chi-Ri medium tank, which it would share some components with. 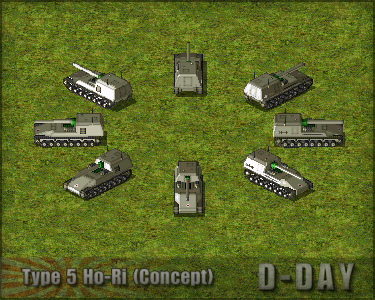 The design seen here is the early concept for the Ho-Ri which features a distinctive sloped front plate, unique among Japanese tanks. 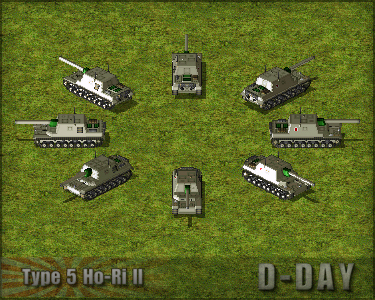 As work on the Type 5 Ho-Ri tank destroyer and Type 5 Chi-Ri medium tank progressed it was decided to change the original sloped front plate and use the same layout at the Chi-Ri. While decreasing frontal protection this change added a 37mm cannon and machine gun to the front hull greatly increasing the tank's defensive fire power. In a further effort to simplify production the fighting compartment of the Type 5 Ho-Ri was moved from the rear of the tank to the center, making the hull design unified with that of the Type 5 Chi-Ri. After three years of development and multiple variants the war ended before work on a prototype could started, ending what would have been one of Japan's most powerful tank designs of WW2. With invasion by the Americans looming over their homeland the Japanese launched an emergency project to develop a new tank destroyer in the shortest possible time. Using the Type 4 Chi-So prime mover as the base the rear cargo area was opened up and a 75mm Type 5 cannon was placed on the roof. Two prototypes of this makeshift tank destroyer where built and tested, a further 200 more where ordered but the war ended before mass production could start. 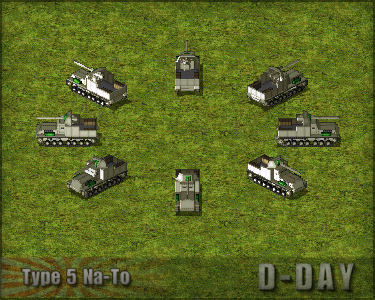 While the development of the Type 5 Na-To was proceeded with as quickly as possible using readily available components, the Type 5 Ka-To was designed from scratch as an more advance alternative. The height was decreased making it less of a target against enemies, It was also lengthened with an extra road wheel and the gun was changed from 75mm to 105mm greatly increasing it's firepower. The war ended before work on a prototype could start and it remained a paper project. Any Idea On When We'll See An Updated Version Of This Mod?